Ryuutama is a Japanese role-playing game that focuses on a group of companions travelling through various landscapes, encountering strange and fantastic places, and forging connections with others. There is combat, but it is not the main point of the game, nor is the traditional dungeon-delve of many adventuring RPGs. As it happens, I know some Japanese, and I am working on a translation of the freely-available Player Summary. It is not a complete rules set, unfortunately, but it offers some insight into Ryuutama‘s systems and goals. Below, I’ve included a (rough) translation of the Minstrel, one of the seven classes in the game. 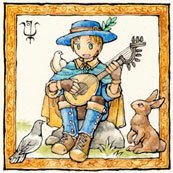 The other classes include the Merchant, Healer, Hunter, Craftsperson, Farmer, and Noble. I hope you enjoy! The details are after the cut! The Gnoll's Den header art by Joanne Renaud and Kaprika. Logo by Joanne Renaud using the Twenty12 font by Paul Sheetz.